Jim Turner is the chief operating officer of Controlled Thermal Resources, an energy company from Australia. On a hill overlooking the Salton Sea, he points out a patch of land that will someday house his company’s first power plant, named Hell’s Kitchen. “We’re standing on top of what is probably the most robust geothermal resource in the United States,” he explains. Geothermal energy uses the earth’s natural heat to create electricity. While there are several different ways to accomplish this, the most common is to take super-heated water from geothermal hot spots and pipe it to the surface. It then turns into steam and spins a turbine, which generates electricity. It’s completely renewable, and generates clean energy around the clock, unlike wind and solar. The company wants to develop 1,000 megawatts of electricity here over the next decade. They say that could power about 1,000,000 homes. And for a state that’s aiming to get half its electricity from renewable sources, that’s no small number. But it’s not just California that’s got these resources. “In the 1950s a large area of land north of Taupo suddenly began to get hot and emit steam. Craters of boiling mud emerged, along with other geothermal phenomena. And so the Craters of the Moon was born. I imagine the social challenge has been local populations not wanting the area despoiled as with wind power towers and the like. Geothermal has not been a “forgotten” or an “overlooked” energy source. There were several locations in the late 70s and 80s in the American west where it was explored. One of them was within 150 miles of my home. The result was then it was “complex” and “expensive to build” and had high maintenance cost. It was given up in part because NG power plants outperformed it economically. The West is not like Iceland where there is “running hot water” on the ground, as it were. Even there, it only amounts to 25% of total electrical production. For CA it will be too little too late by 2032. Salton Sea geothermal? Been there, done that. Geothermal, done right, is a nearly inexhaustible source of heat, thus energy. Hot springs, if dependable, have been used as home heating for more than a century in New York state and other locales. The mantel of the Earth is hot, and is not cooling off any time soon. — At the surface, the water flashes to steam, or it heats a working fluid that produces vapor. — The steam/vapor turns a turbine to create electricity. 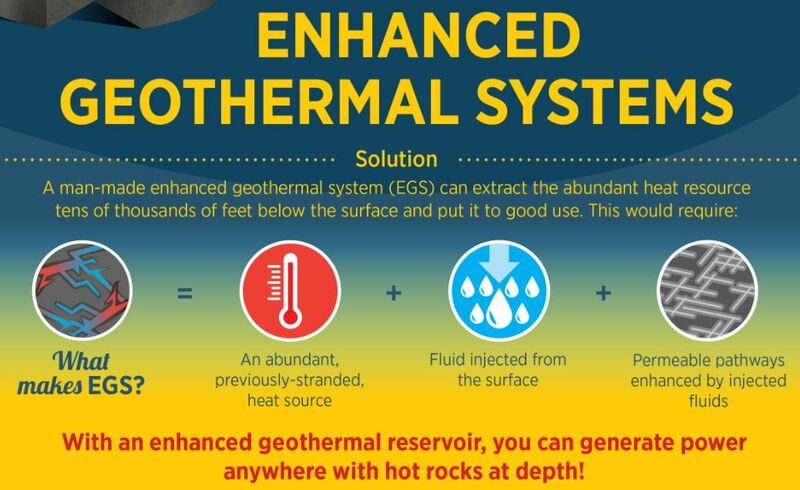 Want to learn more about how an EGS System works? No ford prefect you are wrong. Craters of the Moon was there long before Wairakei started – even people like Rudyard Kipling went to the Karapiti blowhole which was part of it. When Wairakei started, The small area (about 100 hectares) heated up and became more active but within twenty years, .that had died down. The increase in activity was due to the very large mass withdrawal causing a 25bar drawdown in the deep fluid pressure so a steam cap formed. – something that isn’t done nowadays as consents demand near full reinjection of the fluid. AFAIK there’s the 1980’s geothermal project in Southampton centre which puts in 18% of the heat into the local heating scheme, which is 70% gas. So not really that successful. but since the 2015 announcement I haven’t seen news .. I guess they didn’t get the EU grant they wanted. Eden Project already has a massive subsidy per visitor anyway of tens of pounds. \\ 18 Dec 2017 Pipe installation is the first stage of a pioneering #districtheating network in Stoke-on-Trent. Around 700m of pipes are being laid underground. ..Yeh right companies/companies spend billions each year on energy development … but they OVERLOOK magic solutions. If a media narrative is too wow to be true, then it’s probably not true. Formally, geothermal is not a renewable, in that it is not replenished as fast as we might like to use it up. The average geothermal energy flux is pitifully small. Just like fossil fuels, we might consume the low-hanging fruit, but the long term supply outlook is insufficient compared to our long term demand needs. Yes, some regions of the planet have lots, some regions have almost zero. But most of it can never be used. I certainly don’t object to geothermal being exploited where it makes economic sense to do so, but to describe it as a renewable is disingenuous and falls into the green-think of an easy solution that has apparently been overlooked. No, it wasn’t overlooked, greenfaeces, it just doesn’t cut the mustard most of the time in most places. And geothermals biggest problem, few investors. And it’s scalable. Push, single generators, on a closed loop system, drill a little further, superheat the steam further, push two generators, add valves, push four generators, without a lot of investment. So, are we there yet?